All those who’ve left a fine piece of meat on the barbecue for too long, knows all too well that every moment counts when it comes to getting that lean piece of meat cooked to perfection. The Loxone Touch & Grill brings out your inner chef every time you slap a steak, chop, drumstick or burger on the BBQ. 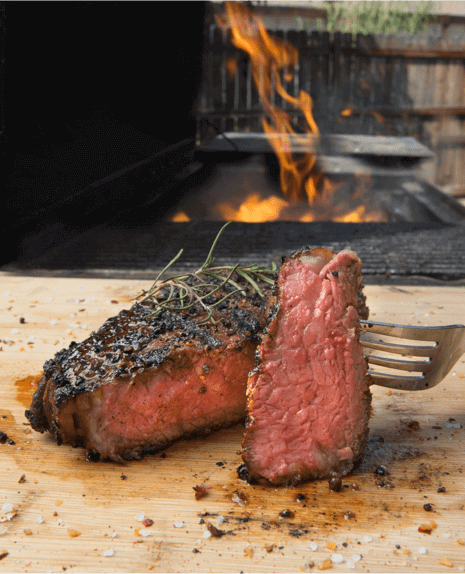 “Medium rare” is, from now on, no longer down to chance thanks to this smarter way to barbecue! 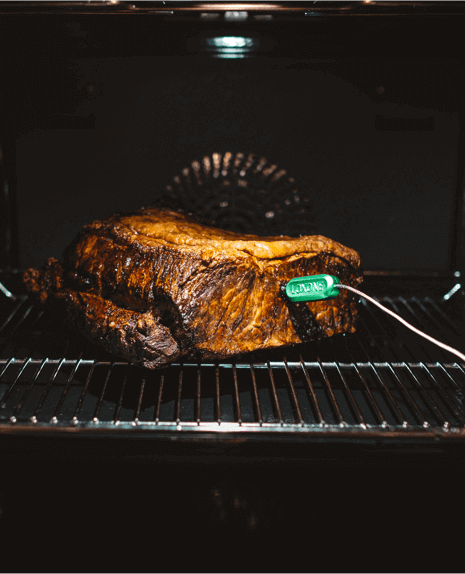 The option to include the Loxone Touch & Grill into your smart home and its unique product features, arguably, make it the world’s most versatile barbecue thermometer. When used as a classic barbecue thermometer your Touch & Grill will ensure that you can accurately measure the doneness of any piece of meat. What’s better than a perfectly cooked steak? Two perfectly cooked steaks. With the Touch & Grill’s two temperature sensors, you can get two measurements at the same time. Need the first steak medium and the second medium rare? No problem. You’ll have all the information that you need right at your fingertips. 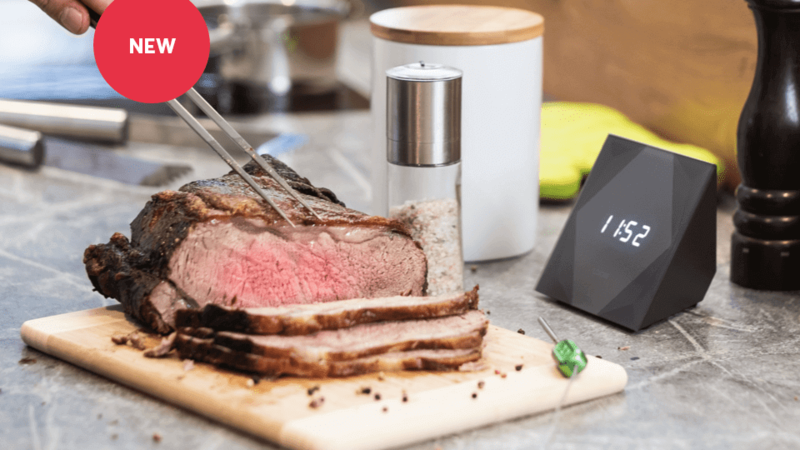 As soon as the thermometer reaches the desired temperature you will be notified via the alarm in your Touch & Grill as well as through the Loxone App – letting you know that your meat should be taken off the grill. 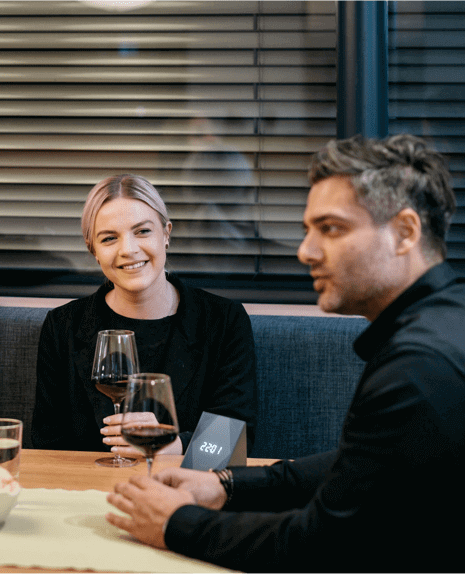 Once your guests have been wowed by your amazing cooking skills and their stomachs are no longer rumbling everyone can begin to relax and enjoy the evening. Including you. 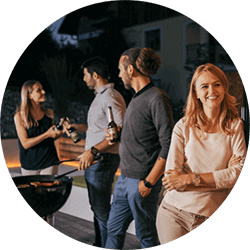 With the Touch & Grill, you can control the party from your fingertips; turn up the music, activate a fancy lighting mood or do whatever else you please – if your friends weren’t impressed before they certainly will be now. Weather permitting this barbecue will be taking place in the garden. The outside is great for the tan, but usually not so great for electrical devices. But fear not, the Touch & Grill has been specifically designed for outdoor use. Its high-quality casing and glass surface are both UV-resistant. It also has a long battery life, so your gathering can run into the night if you wish. Summer does have to come to an end, unfortunately. So for the remaining 51 weeks of the year, it’s back to the tried and tested oven. Unlike the rest of us, the Touch & Grill doesn’t care if it’s inside or out, performing just as well in the kitchen. No matter what you are cooking, be it that gorgeous Sunday lunch for the whole family or your daughters birthday cake, the Touch & Grill makes sure that you and your loved ones get to enjoy only the most perfectly cooked meals and treats. With an integrated timer, this all-rounder becomes a practical assistant for your kitchen. After the time is up you’ll be informed through an alarm from the Touch & Grill and via the Loxone App. Ready, Chef! Plus, if you are listening to one of the Great British Bake Off inspired playlists on Spotify and need to turn up the volume, but your hands are covered in sticky dough… not a problem! You can adjust the volume on your Touch & Grill and just wipe it down when you are cleaning up. The possibilities are (almost) endless. Use your Touch & Grill to check the temperature of the frying oil, your baby’s food or that bottle of red wine that has been sitting on the counter – waiting to be opened. Standing in front of the barbecue, especially on a hot day, is something, you don’t want to do for more than a few hours. Thanks to the Touch & Grill you don’t have to miss out on the fun whilst you’re playing chef. You can do activities with your kids or use the extra time to sit back with a cold beer – with your Loxone App you always have the temperature of your meat on hand. When your fillet reaches the perfect temperature, your home can, for example, lower the music and inform you via Text-to-Speech that it’s time to dish up. When you combine the Touch & Grill with your Real Smart Home, you get the most versatile BBQ thermometer in the world. 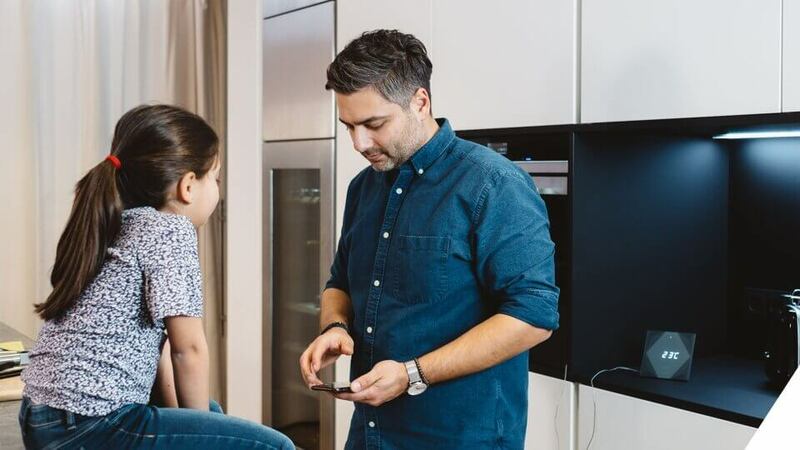 However, all of the basic functions – such as the timer, temperature display, clock and alarm – work without a connection to your Smart Home. Simply take the Touch & Grill with you to your friends. Thanks to its extensive stand-alone functions, you’ll never have to deal with under or overcooked meat again. It’s guaranteed to be the highlight of every barbecue, however you might have to get used to the envious looks. 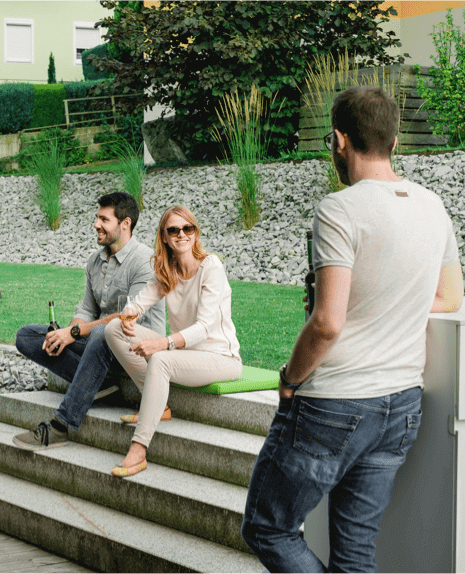 When the Touch & Grill is not being your trusted sidekick on those summer days, it is still an important part of your Loxone Smart Home – offering everyday control at your fingertips. We have invested a lot of time as well as heart, soul and effort into the development of our Loxone Touch range. Our Switch Standard with 5 touch points can also be found in the versatile Touch & Grill. Our Switch Standard recommends the central touch point for lights, with the four smaller corner touch points controlling shading and music. Whether you are in your kitchen or enjoying a glass of wine with your friends on the patio: The portable Touch & Grill can be used in different places and therefore be defined as the control element for two different rooms. Via the app, you can decide which room should be operated via the Touch & Grill. 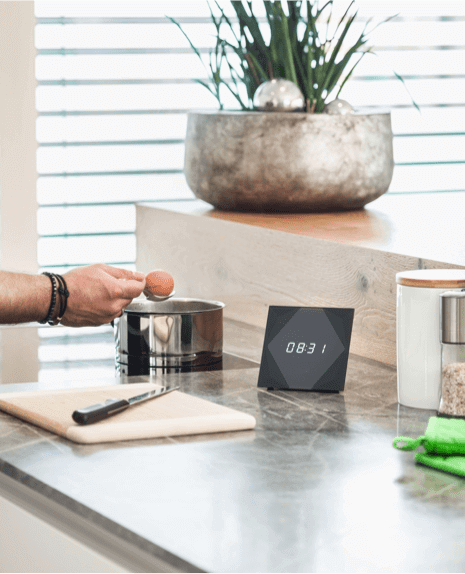 With the Loxone Smart Home App you can already control everything in your smart home, no matter if you’re at home or on the go – so of course, the Touch & Grill works with the same concept: there is no need for another app. 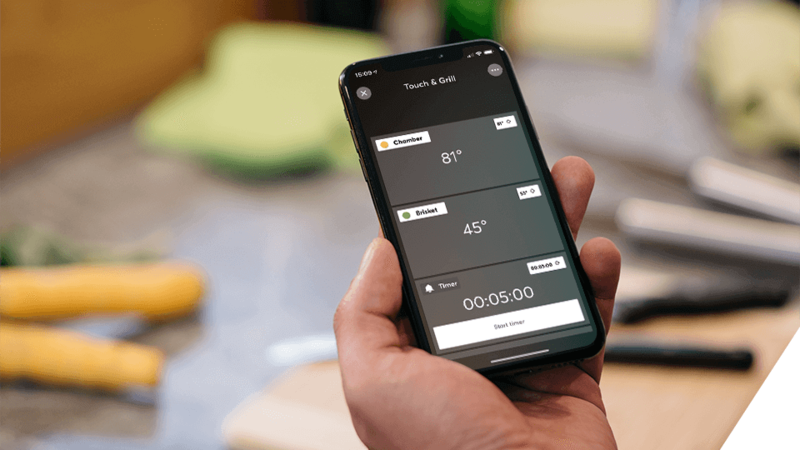 In our intuitive app you can adjust the desired temperature, watch over the current temperature, set a timer, receive related push-notifications, follow the temperature-statistics and set for which room the Touch & Grill should serve as a Touch switch. Long story short: With the Loxone Smart Home App every function of the Touch & Grill is in the palm of your hand. Are you already excited about the first barbecue of the year? Visit our shop to see more on the Touch & Grill.